This is a time to be cautious and not too bullish. Nike (NKE) was favored by Jim Cramer in Friday's Mad Money program. Let's check on the charts and indicators. In this daily bar chart of NKE, below, I can see a mixed picture. NKE corrected to the downside in October-December and has rebounded in recent weeks to approach the September zenith. Prices are above the rising 50-day moving average line and the rising 200-day line. The 50-day average is crossing above the 200-day line for a bullish golden cross (note that a bearish death cross was recorded back in early December). The volume pattern since late December shows that turnover has slowed. The daily On-Balance-Volume (OBV) line has been neutral since November and is not confirming the price gains. The 12-day price momentum study in the lower panel shows lower highs from early January which is a bearish divergence when compared to the price action. This is not a long divergence but in an overbought market you never know what can go "bump in the night." In this weekly bar chart of NKE, below, we can see that prices are above the rising 40-week moving average line. The weekly OBV line shows a small rise from January and the 12-week price momentum study shows a lower high from June/July to now. 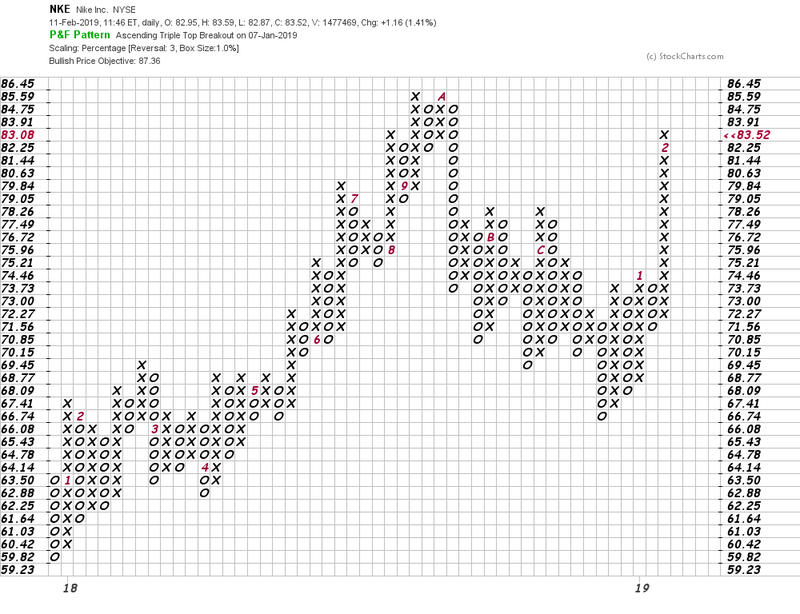 In this Point and Figure chart of NKE, below, we can see an upside price target of $87.36 which would not give us a new high on this chart. Bottom line strategy: The share price of NKE could move higher and break out over its September highs, but the indicators are suggesting to me that this is a time to be cautious and not too bullish.